If you’ve clicked onto this page, then you’re probably like millions of other Americans who can only see what’s wrong with their smile. Perhaps your teeth are discolored, or you have chips or gaps that you wish could just go away. Maybe you’re finally ready to have your teeth straightened, and you’re hoping you can do it without metal braces. Thankfully, we can help you with all of that and more. With our cosmetic services, we can eliminate any imperfections you might have and make your smile truly shine. With the treatments we’ve outlined below, we can give you everything from a small boost to a complete makeover. It’s entirely up to you, and you can get it right here in Enfield at Four Town Dental. If you’re looking to get straighter teeth without having to wear metal braces, then Invisalign® is just for you! Rather than using brackets and wires, Invisalign® straightens the teeth using custom-made, clear plastic aligners that are easily removable. The trays themselves are practically invisible, and you can take them off whenever you need to eat or brush your teeth. In the end, you get an orthodontic treatment that seamlessly fits into your life, making sure the only thing other people will see is your beautiful results. 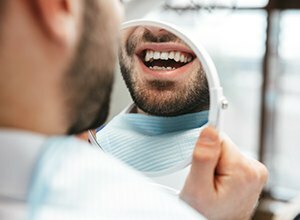 Fillings have been used for decades to repair small cavities and slightly damaged teeth, but traditional metal-fillings always leave a tooth with a noticeable dark gray mark. This is why our practice only uses tooth-colored fillings, which are made of a composite resin that can be specially shaded to match the color of your teeth. This resin is strong, durable, malleable, and it’s practically invisible when it’s placed on the teeth. Whether you have a tooth that needs to be restored or you want to replace your old metal-fillings with something more subtle, tooth-colored fillings always get the job done. If your teeth are stained due to coffee, wine, tobacco, aging, or genetics, there’s nothing at the store that’s going to give you the whiter smile you really want. 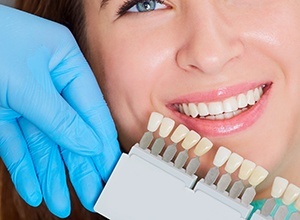 In order to get reliable, dramatic results you can trust, we can provide you with professional teeth-whitening. Our practice offers both Kör Bleaching in-office and take-home whitening treatments, and no matter which one you choose, you’ll always end up with a whiter smile that you can’t wait to show off. Porcelain veneers are one of the most popular cosmetic treatments available today, and it’s also one of the most comprehensive. They are custom-made, wafer-thin ceramic coverings that are bonded to the front of the teeth, and they can be used to fix and mask multiple cosmetic flaws at the same time, including stained, chipped, cracked, gapped, and even slightly crooked teeth. Dental crowns are one of the most versatile treatments in all of dentistry, as they can be used to improve a tooth’s shape and color cosmetically and/or repair one that is too weak to be restored with just a filling. 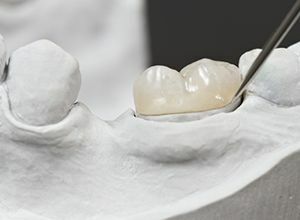 It is a tooth-shaped restoration that simply fits over the top of a natural tooth, and it typically only takes 2 visits to get a custom-made one. With proper brushing and flossing, crowns can easily last for 10 years or more. Crowns can actually be made of a variety of materials, but when it comes to repairing the teeth that can be seen when you smile, our practice prefers to use all-ceramic crowns. 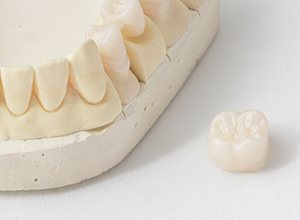 Dental ceramic is one of the most advanced materials in all of dentistry, as it can be just as strong or stronger than natural enamel, and it can also be shaded to perfectly match a person’s tooth color. 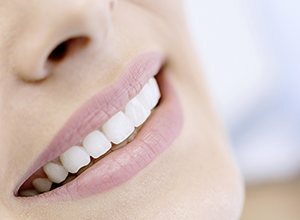 The end result is a new tooth that seamlessly blends into a person’s smile both functionally and aesthetically. If you’re unhappy with the appearance of your smile, now there is something you can do about it! Using just one or two of these simple treatments, we can give you a smile that always fills you with confidence. To figure out which one is best for you, please contact us today for an appointment.